Plastic is one of the most significant pollutants of our planet. According to Our World in Data, 381 million metric tons were produced in 2015. Compared to previous years this number has increased, and it continues to grow. Cumulatively, the world has produced 8.9 billion metric tons of plastic, which accounts for more than 1.2 billion tons for each person who lives today. We live in a world today where every item we use is made of or packaged in plastic. Just as I am writing this article now, I am typing on my keyboard and scrolling with a mouse, both made of plastic. It is almost impossible for the average person today to live a plastic-free life. However, the threat of its waste is constantly looming, contributing to the environmental degradation of our planet. Why is Plastic Pollution Significant in Sustainability? The reason why plastic waste is a widely discussed topic when it comes to sustainability is because it is one of the largest pollutants in our environment. If we don’t recycle, it can take anywhere from 450 to 1000 years to decompose, and many times it is carried through the rivers and ends up in the ocean. Ocean pollution from plastics can have harmful effects on the environment and animal habitats, as well as humans themselves. Although the material is extremely innovative in many ways, 50 percent is designed just for one-time use, and it’s thrown away. 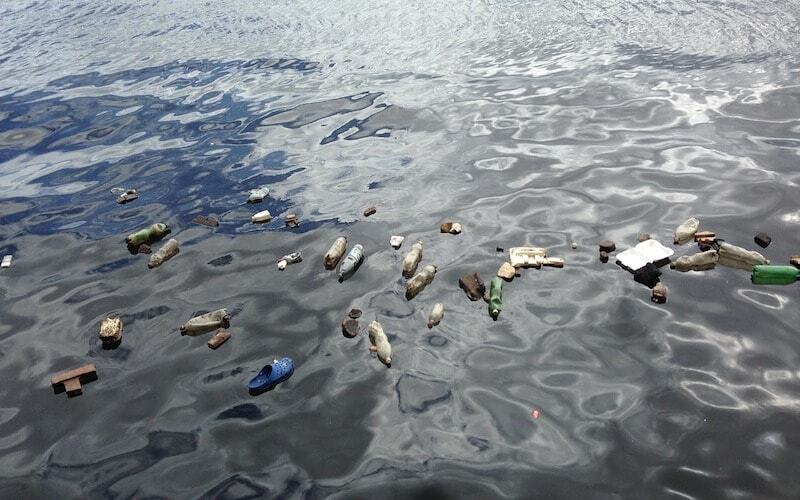 It’s predicted that by the year 2050 there will be more plastic in the ocean than there is fish. As of today, according to Ocean Conservancy, around eight million tons end up in the ocean every year, the issue being that only nine percent of the material in the world is currently being recycled. The rest that doesn’t get recycled breaks down into very tiny particles which are then ingested by fish and other wildlife animals, affecting over 700 species in the ocean. How Does Plastic Affect Animals? When the materials is broken down into particles, fish consume it, thinking it is food. However, the journey doesn’t end here. The food chain continues when other animals eat the plastic-infested fish. Just like that, it travels from species to species until it reaches us, humans. An example to consider is a very recent disturbing story published by DailyMail. While cutting a lobster open, a chef found a large piece of plastic in its organs. The chef said that she had never seen something like that before, adding that it was common to find small pieces in lobsters, but this one was on a whole other level. As already mentioned above, the material travels from the oceans to the organs of different species. Via the food chain, it then can end up in the human body through consumption of not only seafood but other forms of meat as well. Ingestion of the material has harmful effects on our health, being a potential cause of cancer, congenital disabilities, impaired immunity, or other life-threatening problems. So, considering everything, is there something we can do to to help with our plastic problem? In a lot of ways, the classic sustainability adage reigns true: reduce, reuse, and recycle. Charging on grocery bags in stores has proved to be a straightforward and successful way of reducing plastic consumption. According to an article by BBC, ever since the U.K. started charging a five-pence fee, the personal usage of plastic bags has decreased from 140 to only 25 bags per year. Moreover, innovations such as Bio-Plastics have been pivotal in shaping sustainability. In other words, instead of producing plastic which does not break down through natural decomposition, we should switch to biodegradable plastic. Coca-Cola set an example by switching to a biodegradable bottle, removing a potential of 365,000 metric tons of carbon dioxide emissions. Another way to help reduce waste is by removing unnecessary layers in packaging. Around 50 percent of plastic is one-time-use only and is then thrown away within minutes. Companies use too much packaging in their products, and if they reduced this usage, not only will they lower their production costs, but we would also see significant reductions in waste. Reusing plastic is another sustainable solution. Instead of throwing away the bag that you just got from your grocery store, consider keeping it at home so that you can reuse it. Another possibility is to send it back to the grocery store as many stores employ recycling programs. The problem of pollution is a daunting issue, requiring immediate action. Important measures need to be taken as soon as possible so that we don’t further endanger the environment, the animals, and ourselves. However, the good news is that there are steps that can be taken today to begin to alleviate our plastic problem.